WORKING THE ENGELS is adding an extra dose of comedy in this week’s new episode, “Meet Irene Horowitz”: guest star Eugene Levy! 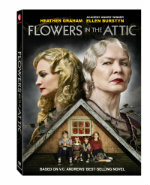 FLOWERS IN THE ATTIC — the book-turned-movie-turned-Lifetime TV movie adaptation starring Heather Graham, Ellen Burstyn, Kiernan Shipka, Mason Dye, and Dylan Bruce that debuted earlier this year, and has a sequel scheduled to air on May 26th — comes to DVD on April 15th, and in addition to the movie, the disc comes with a featurette that goes behind-the-scenes of the making of the project. Comments Off on THE VOICE Exclusive Video: Which Animals Auditioned to be CeeLo Green’s Pet? When CeeLo Green first started off on THE VOICE in season 1, he had a secret weapon: Purrfect the Cat. And while Purrfect was only around for one season, as the exclusive video below shows, it was one heck of a race to get the job.